Federal spending on domestic programs in health care, education, clean energy and infrastructure creates more jobs, dollar for dollar, than military spending. PROVIDENCE, R.I. [Brown University] —New research by the Costs of War Project based at Brown University’s Watson Institute for International and Public Affairs finds that federal spending on domestic programs creates far more American jobs and yields more broad-based benefits than military spending. The study by economist Heidi Garrett-Peltier documented how many jobs are created in a variety of domestic sectors for every million dollars of federal money spent. She compared that to the number of jobs created for every $1 million spent on defense and found that domestic spending outpaces military spending in job creation by 21 percent (for wind energy development) to 178 percent (for elementary and secondary education). Strikingly, Garrett-Peltier found that investments in elementary and secondary education create nearly three times as many American jobs as defense spending, while health care creates about twice as many jobs. 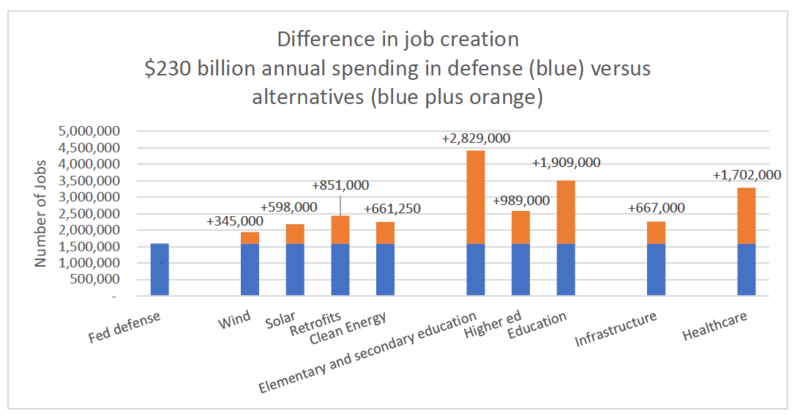 Whereas $1 million spent on defense creates 6.9 direct and indirect jobs, the same amount spent on elementary and secondary education creates 19.2 jobs. $1 million spent on healthcare creates 14.3 jobs. $1 million in federal spending creates fewer jobs than the same spending in nine other areas. Spending on elementary and secondary education creates the most jobs, at 19.2 per $1 million. She used an economic model called an Input-Output (I-O) model to analyze how many jobs are created for every $1 million in spending, drawing on information from the U.S. Economic Census, Internal Revenue Service tax documents, the U.S. Bureau of Labor statistics, U.S. Bureau of Economic Analysis data and other sources. That snapshot helps explain why domestic spending creates more American jobs, she noted. First, some of the jobs created by defense spending “leak” overseas, whereas construction or nursing jobs created by investing in infrastructure or health care are created, and remain, in the United States. Second, the labor intensity involved in domestic spending is greater than defense spending. Whereas the military is more dependent on equipment, and funds allocated might go to products, Garrett-Peltier said, education requires people, like teachers, aides, principals and others. The Costs of War Project has found that war-related spending between fiscal year 2001 and fiscal year 2016 is $230 billion per year. The data shows that the Trump administration’s proposal to increase military spending by $54 billion would create fewer jobs than equivalent spending on health care, education, clean energy or infrastructure, Garrett-Peltier said, and would offer less economic benefit to the nation. “This report is especially important in helping put fact and public interest rather than myth or self-interest at the center of discussions of the Trump administration’s plan for vastly increased military spending,” said Catherine Lutz, co-director of the Costs of War Project and the Thomas J. Watson, Jr. Family Professor of International Studies at Brown. Editor’s Note: Garrett-Peltier recently discussed the study on the Watson Institute’s Trending Globally podcast, available online here.